PHOENIX (Reuters) - Airbus is seeking airline support for a new 400-seat jetliner provisionally dubbed the A350-8000 as competition escalates with Boeing over the world's largest two-engined jets, airline and aviation industry sources said. After talking up the possibility of a new member of its A350 family, the European planemaker has swung into an active pre-marketing phase as it responds to a recent upgrade in the competing Boeing 777. While Boeing has scored successes in the Gulf with its biggest-ever twin-engined jet, the 406-seat 777-9, Airbus is expected to aim its design at airlines that do not always require the performance needed for extreme Gulf conditions. "It would have similar capacity and range (as the 777-9) and substantially lower seat-mile costs," Airbus sales chief John Leahy said in an interview on the sidelines of the Istat Americas air finance conference. "We are showing it to airlines right now." The project is the latest move in a game of leapfrog played by Airbus and Boeing over the past decade in the market for big twinjets, valued at about $1.9 trillion over 20 years. It marks a shift in priorities after the oil price collapse eased pressure on Airbus to upgrade its larger four-engined A380, the output of which is declining because of slow sales. Two airlines whose stance could be decisive in whether Airbus launches the new jet are Singapore Airlines and British Airways . Singapore took delivery of its first smaller A350-900 model this week and has long been weighing up the 777-9. Both airlines declined to comment. In Singapore, where Airbus' planemaking president, Fabrice Bregier, stopped over on Thursday after a China visit, a company spokesman declined to comment. The A350 XWB (Extra Wide Body) family was launched after a string of setbacks in 2006 to compete with Boeing's mid-sized 787 Dreamliner and the larger 777. Boeing responded to the all-new jet by upgrading its existing 777 family to include the 777-9, one of a pair of jets also known as the 777X series. Boeing has sold 306 777X jets. But after an initial burst, sales have hit a lean patch. Airbus has sold 181 A350-1000s. The new, bigger A350 would use a derivative of the latest Rolls-Royce Trent XWB planned for the A350-1000. One person briefed on the plans said it would boost thrust to just over 100,000 pounds from the current 97,000. Airbus believes that would compete well for a large majority of the industry's needs and eclipse the heavier 777X. "We’re not surprised that Airbus is attempting to fill a hole in its product lineup after losing market share to the 777X. 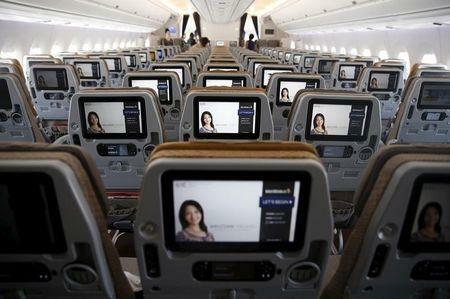 At the end of the day, we’ll still have the better airplane," Marketing Vice-President Randy Tinseth told Reuters. Some analysts said a key to the project would be how easily Rolls-Royce could expand a full slate of projects, even without pushing performance to the limits needed by Mideast carriers. "This sounds like they are making a virtue of its lack of hot-and-high performance compared to 777-9 when maybe it’s the case that Rolls can’t afford, or doesn’t want to, do a much bigger and substantially new engine," said Nick Cunningham of UK-based Agency Partners. One engine expert estimated the upgrade could cost half a billion dollars and require a bigger fan and new materials. Rolls-Royce was not immediately available for comment. To give the new jet enough capacity and range, Airbus would boost the maximum takeoff weight to just over 319 tonnes from 308 tonnes on the A350-1000, the person briefed on the plans said. But it would sacrifice some range compared with the 8,000-mile A350-1000. Airbus says it has not made a final decision on whether to launch a new A350 and will provide an update at the Farnborough Airshow in July. It has been weighing what to call the new member of the A350 XWB family, reflecting deeper decisions on market positioning that can affect billions of dollars in sales. It needs to strike a balance between protecting sales of the A350-1000, by emphasizing what is new, without weakening its long-held mantra of commonality between related aircraft. Until now, the possible new model was widely known in the industry as the A350-1100, continuing a sequence from the 276-seat A350-800 to the 315-seat A350-900 and 366-seat A350-1000. Sources now say it is being pre-marketed with a surprise new identity, the A350-8000, although a final decision has yet to be taken. An earlier working title was A350-1000 XL. Leahy confirmed Airbus was reluctant to call it A350-1100. "You don't want it so close to the 1000 that it is an either-or decision. You have the 1000 and another airplane, with equal gaps of 40 seats between the 900 and 1000 (models), and then whatever this becomes." Eight is a number widely used by planemakers and is seen as a symbol of success in a key battleground for sales: Asia. "Eight is a very nice number out in Asia, but we are not going to comment until we launch the program," Leahy said. If the name is confirmed, Airbus will be hoping to bury any association with the last jet to use the 8000 model code: a VIP version of its A340, only one of which was ever built.